I misjudged my husbands condition when I ordered this, and it was delivered right before he was admitted to Hospice care. It was used only once to transport him from our bed to a hospital bed. This is the electric model, and I also purchased an extra battery (never used) and a Hoyer sling (NA 1069 FULL BACK, 6-PT, MED). These are included in the asking price. 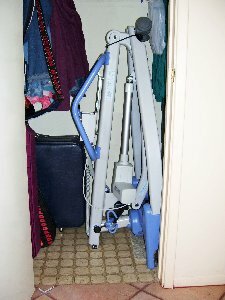 It is folded right now and fits in my small front closet (see attached photo). I'm hoping to find a local buyer, since the lift will fit in the trunk of a car.